The trend towards increasingly sophisticated malware behavior, highlighted by the use of exploits and other attack vectors, makes older platforms so much more susceptible to ransomware attacks. From June to November, Windows 7 devices were 3.4 times more likely to encounter ransomware compared to Windows 10 devices. 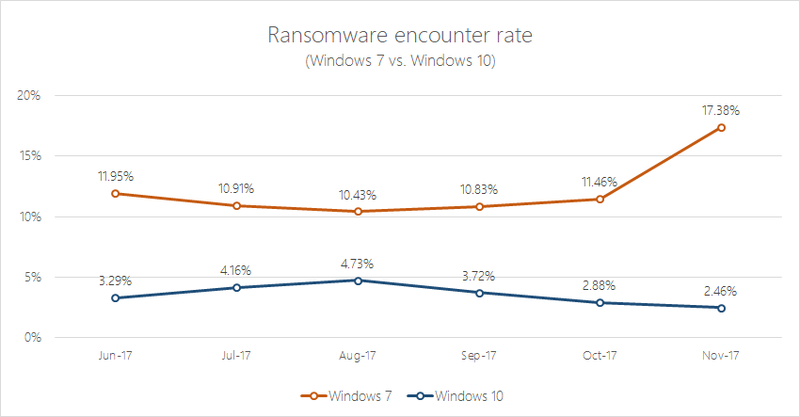 Considering that Windows 10 has a much larger install base than Windows 7, this difference in ransomware encounter rate is significant. Figure 1. Ransomware encounter rates on Windows 7 and Windows 10 devices. Encounter rate refers to the percentage of computers running the OS version with Microsoft real-time security that blocked or detected ransomware. The data shows that attackers are targeting Windows 7. Given todays modern threats, older platforms can be infiltrated more easily because these platforms dont have the advanced built-in end-to-end defense stack available on Windows 10. Continuous enhancements further make Windows 10 more resilient to ransomware and other types of attack. The year 2017 saw three global ransomware outbreaks driven by multiple propagation and infection techniques that are not necessarily new but not typically observed in ransomware. While there are technologies available on Windows 7 to mitigate attacks, Windows 10s comprehensive set of platform mitigations and next-generation technologies cover these attack methods. Additionally, Windows 10 S, which is a configuration of Windows 10 thats streamlined for security and performance, locks down devices against ransomware outbreaks and other threats. In May, WannaCry (Ransom:Win32/WannaCrypt) caused the first global ransomware outbreak. It used EternalBlue, an exploit for a previously fixed SMBv1 vulnerability, to infect computers and spread across networks at speeds never before observed in ransomware. On Windows 7, Windows AppLocker and antimalware solutions like Microsoft Security Essentials and System Center Endpoint Protection (SCEP) can block the infection process. However, because WannaCry used an exploit to spread and infect devices, networks with vulnerable Windows 7 devices fell victim. The WannaCry outbreak highlighted the importance of keeping platforms and software up-to-date, especially with critical security patches. Windows 10 was not at risk from the WannaCry attack. Windows 10 has security technologies that can block the WannaCry ransomware and its spreading mechanism. Built-in exploit mitigations on Windows 10 (KASLR, NX HAL, and PAGE POOL), as well as kCFG (control-flow guard for kernel) and HVCI (kernel code-integrity), make Windows 10 much more difficult to exploit. In June, Petya (Ransom:Win32/Petya.B) used the same exploit that gave WannaCry its spreading capabilities, and added more propagation and infection methods to give birth to arguably the most complex ransomware in 2017. Petyas initial infection vector was a compromised software supply chain, but the ransomware quickly spread using the EternalBlue and EternalRomance exploits, as well as a module for lateral movement using stolen credentials. On Windows 7, Windows AppLocker can stop Petya from infecting the device. If a Windows 7 device is fully patched, Petyas exploitation behavior did not work. However, Petya also stole credentials, which it then used to spread across networks. Once running on a Windows 7 device, only an up-to-date antivirus that had protection in place at zero hour could stop Petya from encrypting files or tampering with the master boot record (MBR). 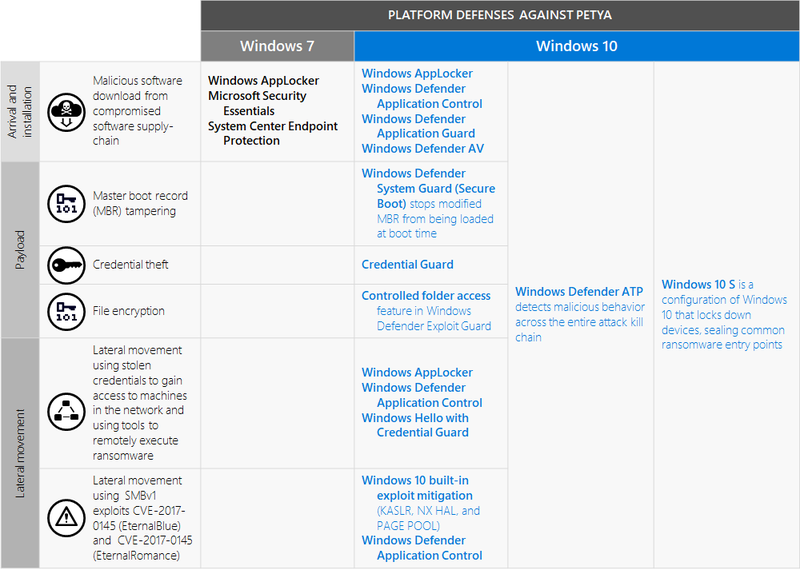 On the other hand, on Windows 10, Petya had more layers of defenses to overcome. Apart from Windows AppLocker, Windows Defender Application Control can block Petyas entry vector (i.e., compromised software updater running an untrusted binary), as well as the propagation techniques that used untrusted DLLs. Windows 10s built-in exploit mitigations can further protect Windows 10 devices from the Petya exploit. Credential Guard can prevent Petya from stealing credentials from local security authority subsystem service (LSASS), helping curb the ransomwares propagation technique. Meanwhile, Windows Defender System Guard (Secure Boot) can stop the MBR modified by Petya from being loaded at boot time, preventing the ransomware from causing damage to the master file table (MFT). In October, another sophisticated ransomware reared its ugly head: Bad Rabbit ransomware (Ransom:Win32/Tibbar.A) infected devices by posing as an Adobe Flash installer available for download on compromised websites. Similar to WannaCry and Petya, Bad Rabbit had spreading capabilities, albeit more traditional: it used a hardcoded list of user names and passwords. Like Petya, it can also render infected devices unbootable, because, in addition to encrypting files, it also encrypted entire disks. On Windows 7 devices, several security solutions technologies can block the download and installation of the ransomware, but protecting the device from the damaging payload and from infecting other computers in the network can be tricky. With Windows 10, however, in addition to stronger defense at the infection vector, corporate networks were safer from this damaging threat because several technologies are available to stop or detect Bad Rabbits attempt to spread across networks using exploits or hardcoded user names and passwords. More importantly, during the Bad Rabbit outbreak, detonation-based machine learning models in Windows Defender AV cloud protection service, with no human intervention, correctly classified the malware 14 minutes after the very first encounter. The said detonation-based ML models are a part of several layers of machine learning and artificial intelligence technologies that evaluate files in order to reach a verdict on suspected malware. 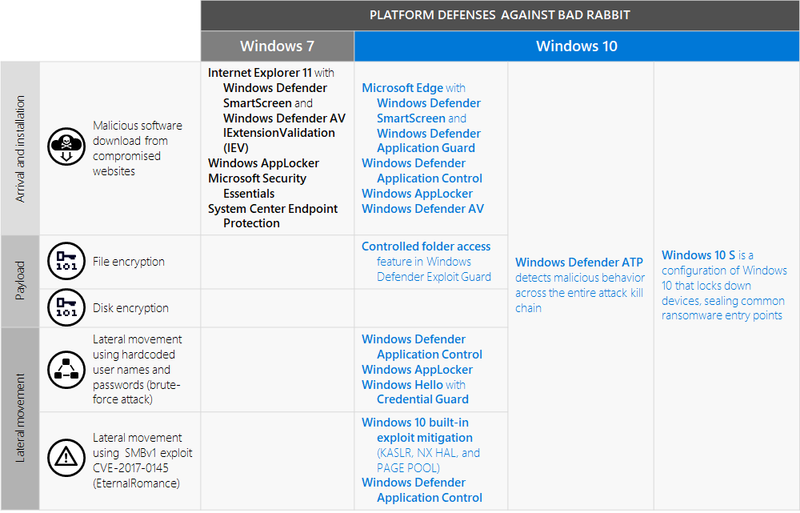 Using this layered approach, Windows Defender AV protected Windows 10 devices with cloud protection enabled from Bad Rabbit within minutes of the outbreak. As these outbreaks demonstrated, ransomware has indeed become a highly complex threat that can be expected to continue evolving in 2018 and beyond. The multiple layers of next-generation security technologies on Windows 10 are designed to disrupt the attack methods that we have previously seen in highly specialized malware but now also see in ransomware. 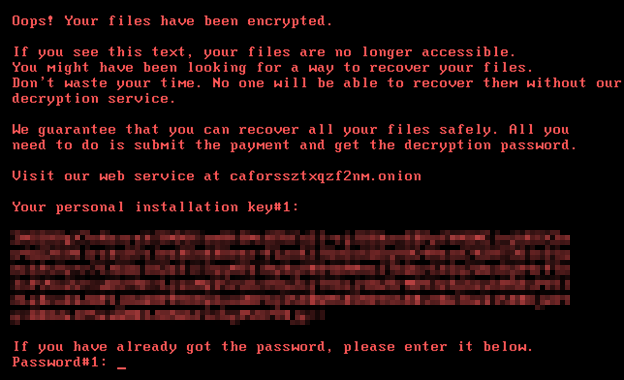 For end users, the dreaded ransom note announces that ransomware has already taken their files hostage: documents, precious photos and videos, and other important files encrypted. On Windows 10 Fall Creators Update, a new feature helps stop ransomware from accessing important files in real-time, even if it manages to infect the computer. When enabled, Controlled folder access locks down folders, allowing only authorized apps to access files. Controlled folder access, however, is but one layer of defense. Ransomware and other threats from the web can be blocked by Microsoft Edge, whose exploit mitigation and sandbox features make it a very secure browser. Microsoft Edge significantly improves web security by using Windows Defender SmartScreens reputation-based blocking of malicious downloads and by opening pages within low-privilege app containers. Windows Defender Antivirus also continues to enhance defense against threats like ransomware. Its advanced generic and heuristic techniques and layered machine learning models help catch both common and rare ransomware families. 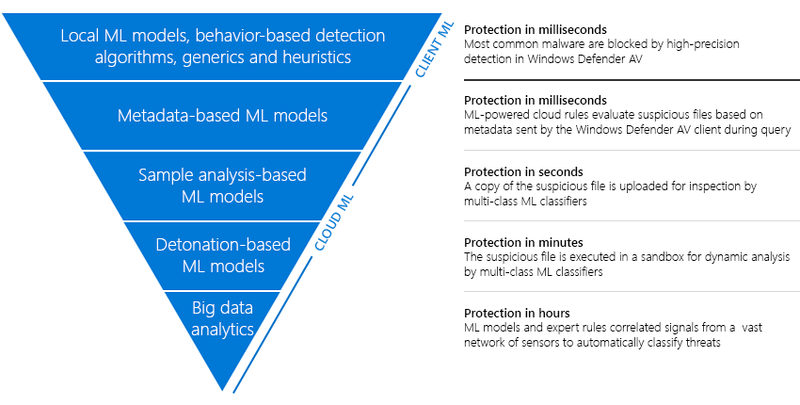 Windows Defender AV can detect and block most malware, including never-before-seen ransomware, using generics and heuristics, local ML models, and metadata-based ML models in the cloud. In rare cases that a threat slips past these layers of protection, Windows Defender AV can protect patient zero in real-time using analysis-based ML models, as demonstrated in a real-life case scenario where a customer was protected from a very new Spora ransomware in a matter of seconds. In even rarer cases of inconclusive initial classification, additional automated analysis and ML models can still protect customers within minutes, as what happened during the Bad Rabbit outbreak. Windows 10 S locks down devices from unauthorized content by working exclusively with apps from the Windows Store and by using Microsoft Edge as the default browser. This streamlined, Microsoft-verified platform seals common entry points for ransomware and other threats. For enterprises and small businesses, the impact of ransomware is graver. Losing access to files can mean disrupted operations. Big enterprise networks, including critical infrastructures, fell victim to ransomware outbreaks. The modern enterprise network is under constant assault by attackers and needs to be defended on all fronts. Additionally, the industry-best browser security in Microsoft Edge is enhanced by Windows Defender Application Guard, which brings Azure cloud grade isolation and security segmentation to Windows applications. This hardware isolation-level capability provides one of the highest levels of protection against zero-day exploits, unpatched vulnerabilities, and web-based malware. For emails, Microsoft Exchange Online Protection (EOP) uses built-in anti-spam filtering capabilities that help protect Office 365 customers against ransomware attacks that begin with email. Office 365 Advanced Threat Protection helps secure mailboxes against email attacks by blocking emails with unsafe attachments, malicious links, and linked-to files leveraging time-of-click protection. Windows Defender Advanced Threat Protection allows SecOps personnel to stop the spread of ransomware through timely detection of ransomware activity in the network. Windows Defender ATPs enhanced behavioral and machine learning detection libraries flag malicious behavior across the ransomware attack kill-chain, enabling SecOps to promptly investigate and respond to ransomware attacks. With Windows 10 Fall Creators Update, Windows Defender ATP was expanded to include seamless integration across the entire Windows protection stack, including Windows Defender Exploit Guard, Windows Defender Application Guard, and Windows Defender AV. This integration is designed to provide a single pane of glass for a seamless security management experience. With all of these security technologies, Microsoft has built the most secure Windows version ever with Windows 10. While the threat landscape will continue to evolve in 2018 and beyond, we dont stop innovating and investing in security solutions that continue to harden Windows 10 against attacks. The twice-per-year feature update release cycle reflects our commitment to innovate and to make it easier to disrupt successful attack techniques with new protection features. Upgrading to Windows 10 not only means decreased risk; it also means access to advanced, multi-layered defense against ransomware and other types of modern attacks. Receive error “The UAG Configuration cannot be loaded from Forefront TMG Storage” while launching the UAG 2010 management console.